I had some lentils on to soak, but dinner guests fell through, so I decided to get more adventuresome than just a tasty dahl. I tend to be fairly non-specific with the lentils - I most often use a combination of red and brown, but other sorts are good, too. Soak the lentils for about six to eight hours, rinse and drain. Fry the onion, garlic and ginger. After two or three minutes, add the chilli and spices. Add the tomatoes, fry, then add the lentils. Slowly add the stock about a half cup at a time, letting the stock soak in, simmering on low and stirring occasionally, for about twenty minutes. I liken this to cooking a risotto. 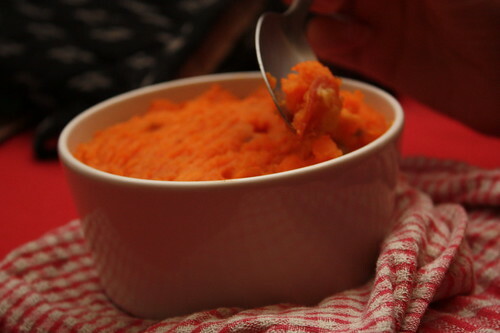 Cook and mash the sweet potatoes. Divide lentil mixture into four ramekins. Add mash potato to top, ensuring that all of the lentils are covered. Bake at 180C for about ten minutes. Most shopping centres were quite good for vegetarian food: in the Bugis Junction level three food court we found the Pine Tree Cafe, an all vegetarian stall. Here we ordered the noodle soup and the laksa, and both were excellent. At Suntec City we found Indinine and Pangat, both located in the "Sky Garden" on level three. Indinine was a fusion cafe, where the beef on my curried rice looked so real I had to double check that it was actually mock meat. Indinine does not indicate that it is a vegetarian restaurant, hence my confusion. D ordered the mushroom rice, which was rich with that heavy mushroom flavour, and very tasty. We later tried Pangat, an Indian vegetarian restaurant. The Aloo paratha was excellent, as were the other dishes that we ordered, which alas we neither photographed nor can recall at this time. By accident on our wanderings we discovered Xing Hua Vegetarian Restaurant, a combination pre-cooked/a la carte restaurant in the Albert Mall, just where it meets Bencoolen Street. They serve fresh juices, and the laksa was fantastic. The prices were very cheap, too, though at this restaurant very few of the staff spoke English, so that is my caution to you if you don't speak Mandarin. Confused, we wandered around the base of this smooth office building. Eventually we asked the security guard, and he directed us to the fifth floor, where the lift doors opened to an immaculate restaurant. "Is this it?" D asked. In answer, I pointed to the Buddha by the front door, and we wandered in. Our waiter didn't speak English, so D was forced to rely upon me for translating, and couldn't resort to his usual trick of asking the waiter for his favourites, to help in deciding. We ordered the olive rice, some satay, something with mushrooms and, based on the advice of the internet, the crispy fried pumpkin roll. 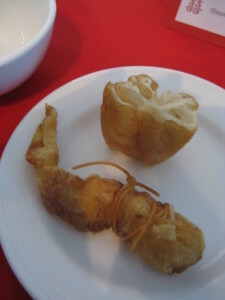 The latter was a delightful mixture of textures and flavours, some sort of pumpkin puree wrapped in rice noodles and then fried. The satay was a tasty combination of mock meats and vegetables, and the rice and mushrooms were also quite good. Overall the experience was very enjoyable, I would certainly return. After visiting Kwan Yin and the Kek Lok Si temple, we meandered underneath the temple to the Kek Lok Si Vegetarian Restaurant. The food was excellent, and moderately priced, and the curry was tasty with a spicy aftertaste, but the staff spoke very little English and didn't take well to questions, so going there might be troublesome for some. Lily's Vegetarian Kitchen, located about a 10 minute walk from the Gama builiding, is a two-floored fast food and a la carte restaurant. We accidentally ended up on the first floor, but the manager called our orders down and made us stay upstairs to eat, though we were scolded before we left. The satay to share was excellent, made of soft mock meats, and the noodles we ordered - one laksa, one noodle soup - were delicious and flavoursome. Including drinks, the meal rounded to about 20RM, about midprice for two of us for a lunch meal. My aunts arranged the second of our wedding banquets, as they had all been unable to attend the first in Australia. We arrived at Jade Palace to discover its full name is Jade Palace Seafood Restaurant. A hissed conversation ensued, a mix of Cantonese, Malay and English, before my aunt reassured us that all the vegetarian weddings were held there. Seated by a wall of fishtanks filled with poor creatures doomed to eventually become someone's dinner, we were treated to the most delicious vegetarian Chinese food I have ever eaten. We had eight courses of food, most of which I only rarely eat in Australia, the courses as follows: entree/pick pick, tofu + vege soup, crispy fried mock chicken, fish, wintermelon in sauce, prawns and squid, mixed vegies, and sweet longan for dessert. It continues to astound me how well some restaurants cater for vegetarianism, and how poorly others grasp it. In Penang we had an eight course vegetarian wedding feast, conforming to the traditions, catered entirely by a seafood restaurant; in a seafood restaurant in Australia, I would struggle to find a single dish on the menu that I could eat. Smell is such a powerful, evocative tool. Walking into my local Chinese grocery store reminds me of my childhood, the smell of spices and the rounded, heavy tones of Cantonese upon the air. The smell of stock, bubbling on the stove, reminds me of my mother, pounding blachan, spending hours chopping and spicing and stirring. Like my mother, I didn't really learn to cook until I left my parents' house: now it is my delight. There are styles of cooking that I struggle to replicate, dishes that I adore but never succeed in cooking. this latest trip has stirred such a passion in me, and my inability to cook Nonya and other local Malay styles is something that I intend to rectify. My favourite way of eating in Penang is at the local makanan, or as my father likes to call them, mucking stalls. These sprawling, open air (though often covered, on account of the rain), tiny food stalls offer a range of food styles and drinks, the smell as you reach them is a delightful intermingling. The stalls will often only specialise in a handful of dishes, creating an interesting competition between the stalls. I love the noodle stalls the most: old Chinese ladies will select foodstuffs as you point at them, until the tiny basket is full and she will either throw it all into a wok, or put it in a bowl and cover it all with hot stock. It's fast and delicious, and the fast cooking is one of the more hygienic ways to prepare the food in the humid, stifling environment. This visit we only had the opportunity to visit the makanan at the Batu Ferrenghi pasar malam, and alas, no photos, as the lights as always are dim and sketchy, and make for terrible photography. Wedding cakes are expensive and I loathe the icing, and with so many coeliac friends we didn't want them to feel left out, so we made cupcakes. When I say "we" I mean my amazing, beautiful friends made the cupcakes, whilst I was off doing obligatory family things. Sift the flour, baking powder and cocoa together, and mix in the sugar. Add in the vanilla essence, followed by the nuttlex and the apple sauce, and then slowly add the milk, mixing as you add, until a thick batter forms. Mix in the choc chips, then leave the batter to sit for five minutes. Divide the mixture into a twelve pan cupcake tray, and bake for 15 minutes at 180C. 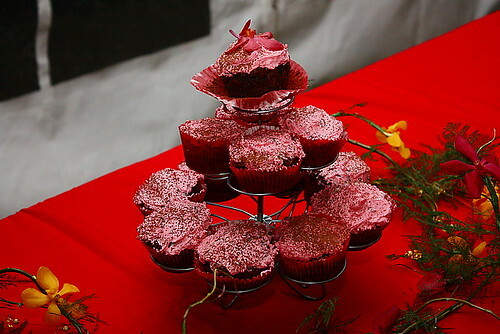 These were iced using a mixture of icing sugar, nuttlex and the juice from frozen raspberries that were left to melt in a colander, and sprinkled with cocoa powder on the top. The raspberry flavour really came through, having sat for an evening. The cupcakes were made the night before, and iced the night before, and sat in the cool room over night. There was no problem to the flavour or texture, in fact it gave them a sort of denseness that made them extra delicious. I've posted the recipe this was based on before, on my previous blog. The wedding banquet is filled with superstitions and is steeped in tradition. It is customary to serve shark's fin soup, to demonstrate wealth. It is usual to serve noodles for longevity, and a whole fish to indicate abundance, and duck and pork and sometimes there are eggs involved. Being vegan, we could not take the usual Chinese in Australia option, which is to enlist one of a handful of local Chinese restaurants kitted out for the eight or ten course affair. Faced with the alternative of catering it ourselves, we elected to employ the services of Lotus Vegetarian Restaurant. Vegetable and Tofu Soup (gluten-free) - this was in place of a 'shark fin' soup, traditionally served to indicate wealth. Independent of the catering provided by Lotus, we also had fruit (as is traditional) for dessert, with wedding cupcakes, the recipe to which will follow in due course. The quoted cost per head was $23.00, for an estimated 120 people, and we provided the tamari to be used as the soy sauce substitute. A week before the wedding, there was some discussion that the mock meat being used in Perth might not be vegan. To avoid any confusion, my mother spoke to the owner, being very specific about whey being on the ingredient lists for any of the meats, and in the end was confident that the only mock meat being used for the wedding was vegan. On the day, L and M went to collect the food, but due to a mix up no payment had been made. This problem in payment was perhaps our problem for not following it up in advance, but also the restaurant's problem, as they had known in advance that a third party would be collecting the food. The noodles and the rice, which were supposed to be gluten free, turned up with fake meat in them, rendering them potentially harmful to coeliacs. These technical hitches aside, the food was excellent, to the point that many omniverous and vego friends alike asked for the restaurant's details. The curry especially had a brilliant flavour, though it was very spicy. In hindsight, the dishes should have been reordered so the curry was followed by the rice. Lotus provided the food only, serving etc was performed most excellently by L + M, and a few other acquaintances that we enlisted (and paid). Overall, the food from Lotus, cooked to order, was excellent, but I would only recommend them as caterers if you speak Cantonese and remember to work it all out beforehand, or if you don't wish to change or substitute ingredients at all. If you are going to the restaurant, I recommend ordering off the menu, rather than taking the buffet - it's always really tasty.